Seen here are Cecil College President Dr. Mary Way Bolt, Walter Wassmer of the Maryland Law Enforcement Officers, Inc., and Cecil College Foundation Executive Director John Beck. NORTH EAST, Md. – Cecil College was the recipient of a $1,000 donation from the Maryland Law Enforcement Officers (MLEO), Inc., on Tuesday, July 17, during a presentation on the North East Campus. 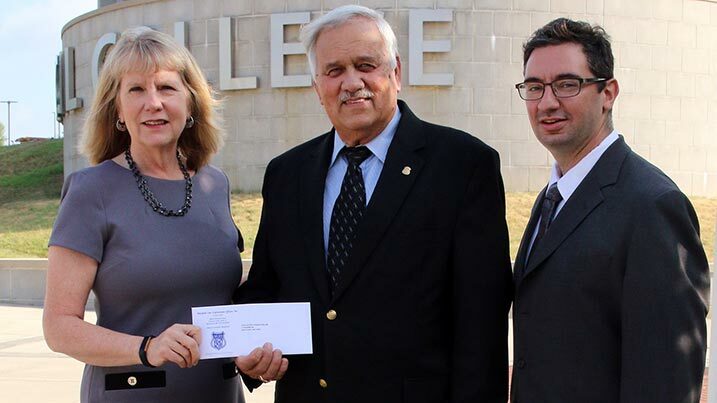 Presenting the check to Cecil College President Dr. Mary Way Bolt was Walter Wassmer, retired Maryland State Trooper and former president of MLEO. Established with a founding gift of $1,500 in August 2004, the MLEO Scholarship Fund provides annual, need-based, financial assistance to a student from Maryland planning a career in law enforcement. Maryland Law Enforcement Officers, Inc. is a non-profit organization, headquartered in Baltimore, comprised of current and former law enforcement officers throughout the state. MLEO annually makes contributions to various colleges to help support scholarship funds used to assist students planning careers in law enforcement.